April 29, 2012 - The first Boeing 787 Dreamliner to be assembled in South Carolina rolled out of final assembly on Friday to great fanfare from the crowd of nearly 7,000 Boeing employees and invited guests. The festival-like atmosphere, featuring aerial displays, music and entertainment, was a fitting celebration to commemorate assembly completion of the first 787 built at the North Charleston, South Carolina facility. The airplane's rollout marks the first time that a Boeing commercial airplane has been produced in the Southeastern United States. "This is a proud moment for Boeing as we roll out an airplane from our third final assembly site," said Jim Albaugh, president and chief executive officer, Commercial Airplanes. "Today I welcome the South Carolina team into a small and elite fraternity a fraternity of workers who have built one of the most complex machines in the world a commercial airplane." "Every one of our South Carolina teammates should be extremely proud of this historic accomplishment," said Jack Jones, Boeing South Carolina vice president and general manager. "This team has shown that we can build airplanes in South Carolina that meet the high Boeing quality standards, and do so with an exceptional workplace safety record." The airplane next goes to the flight line, where it will go through systems checks and engine runs in advance of taxi testing and first flight. 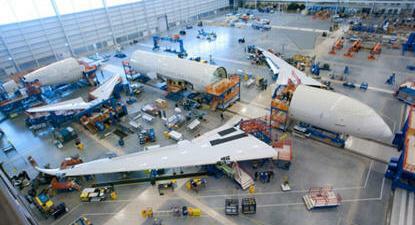 The airplane remains on schedule for delivery to Air India in mid-2012.